"Lifeless," "disappointing," "ordinary," "dull" and "old" are not words usually associated with the Duchess of Cambridge. But those are a few of the kinder words being associated with her first official portrait, which was unveiled today in London. Kate Middleton and Prince William visited the National Portrait Gallery today for the unveiling. Award-winning artist Paul Emsley painted Kate against his trademark black background with a slight smile - or smirk, depending on whom you ask - framed by her lustrous brown hair. While the duchess reportedly described the painting as "amazing," art critics, royal watchers and the Internet have been far less diplomatic. Click here to see more photos of Kate Middleton through the years. "GHASTLY: the new Kate portrait. Has turned her into a thrice-divorced senior VP who reads Fifty Shades of Grey and is mean to bus drivers," tweeted Shinan Govani. "Any artist who has put in that much work deserves credit but I think Kate's portrait just looks far too old and a teeny bit evil unlike her!" tweeted George Weightman. Other Twitter users declared the painting "straight from the Twilight franchise" and "the new Mona Lisa." One called it "the before picture on a miracle anti-aging skin cream advert." A more supportive fan, Lily Bhattacharya, tweeted, "I think she looks beautiful ignore the haters Dutchess [sic] Kate!" "All of the die-hard Kate fans are up in arms over the criticism when, actually, I think they should be seeing it as more of a compliment toward Kate, because the general consensus seems to be that Kate is much prettier in real life," ABC News' royal contributor Victoria Arbiter said. Most agree that the skillful likeness is lifelike, but take issue with what has been lost in translation. "It's extraordinary when you look at it and it sort of looks like a photograph so I can appreciate the technique and the talent in terms of construction, but to me it's just utterly lifeless," Arbiter said. "There doesn't seem to be any of her vitality, her sparkle, her youth. There's none of the mischief behind her eyes, none of the light in her eyes. It just comes across as a little flat, lifeless and dull." Portrait drama is not new to England's elite. "Sir Winston Churchill groused that his official portrait made him look like a half-wit; that of King George V was burned; Prime Minister Margaret Thatcher complained that her eyes were wrong," said a 1984 Associated Press article called "Likeness Disliked." There have been controversial portraits of powerful figures from Churchill to Queen Elizabeth II to Princess Diana. "Official portraits are a problem," the piece said. "When the subject is famous, Britain turns into a nation of art critics and it's open season on the artist." This is certainly the case with Kate's painting, even with professional art critics. "Seriously, as a concept, what is it? It's like a giant Polaroid. Like she went into a photo booth and had that picture taken and blown up to a huge size, it would look more or less the same, wouldn't it?" said Waldemar Januszczak, art critic for The Sunday Times. 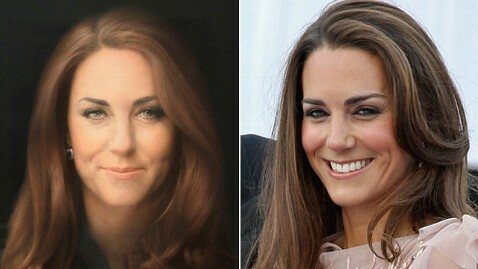 Arbiter said the number one criticism of the painting has been that it makes Kate look much older than her 31 years. "She just seems to have lines that aren't there and bags under her eyes," she said. "I just thought, 'I'm so glad that 200 years from now there will be lots of photographs.' I'm just glad we've got photos to say, 'Actually, she was really beautiful.'"